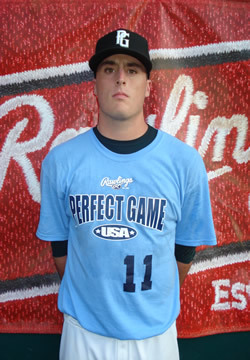 Patrick Carbone is a 2010 1B/P with a 6'1'', 200 lb. frame from North Wales, PA who attends St. Joeseph's Prep. Solid athletic body, good present strength. Tall relaxed stance, rotational swing, good bat speed, line drive plane, squares up well, uses whole field, alley power, could develop power further. Nice defensive actions at 1B, feet work, agile, soft hands, good arm, 7.14 runner, could probably play OF, too. Also pitched, FB to 83 mph, good arm speed, compact arm action, commands FB/CB well, stays low in zone. Nice all around talent. Good student.